Confusion and memory loss are common dementia symptoms. Now scientists have linked canola oil to dementia in a just published report. Temple University researchers recently carried out an experiment to determine how the popular cooking oil might have an effect on the brain. Their report was published this week in Scientific Reports. To carry out their study, the researchers examined six-month old mice, dividing them into two separate groups. 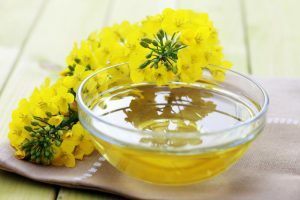 One group was given a normal diet, while the second group received a diet that was supplemented with the equivalent of two tablespoons of canola oil, explained the study’s authors. After an observation period of 12 months, the researchers weighed the mice. They found that those mice that were on the diet supplemented with canola oil weighed significantly more compared to those that were on just a regular diet. Then they assessed the short-term memory, working memory and their learning ability through administering tests in mazes. They quickly discovered that the mice that were consuming the canola oil suffered working memory damage. The mice who consumed the oil had lower levels of amyloid beta 1-40, which is a protein that is beneficial to the brain. Researchers said that as a result of lower amyloid beta 1-40, the mice who consumed canola oil showed more formation of amyloid plaques throughout their brain, with neurons being with the amyloid beta 1.42. The damage accompanied a significant lowering of the number of contacts between the neurons, which is indicative of synapse injury. Synapes are the areas where neurons are able to contact one another, and play a key role in memory formation as well as retrieval. The researchers’ findings suggest that canola oil cannot be beneficial to the brain, and that is especially the case when consumed over a long period of time. The researchers now are hoping to further this study to find out more on exactly how much of the oil can produce the changes in brains and if there is a link with Alzheimer’s disease. The lead researcher of the group Domenico Pratico said that canola oil is vegetable oil, but people must be careful prior to saying it is healthy. Based upon evidence from the study on six month old mice our opinion is canola oil should not be looked at as being the equivalent to oils that have been proven to be beneficial to human health.